Close to Sucre, workers of a cement factory found the largest collection of dinosaur footprints in the world. According to the newest count, you can see 12.000 of them in the Parque Cretácico, just outside the city. 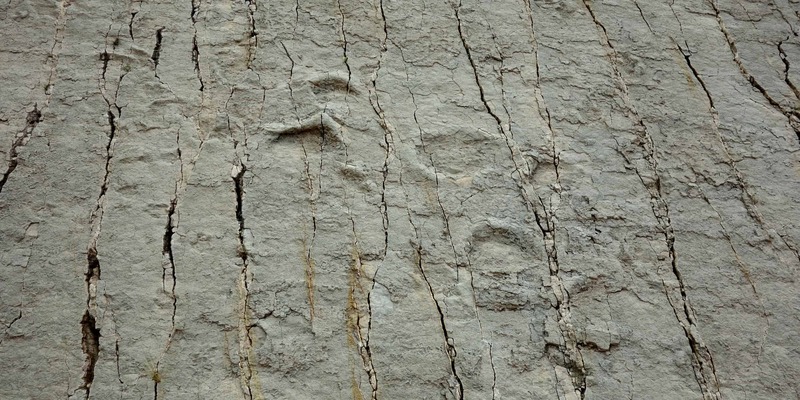 Due to the shifting of tetonic plates, the dinosaur footprints now appear on a wall. You can see them from a viewing platform or you can get close by joining one of the guided tours that regularly run in both English and Spanish. Also, take a look at the two museums on the grounds in which you can learn more about dinosaurs, the evolution of earth and even see a dinosaur skeleton. To get here, take micro number 4 from the intersection Arenales/Junín, just one block away from the main square. The Parque Cretácico is the final stop. 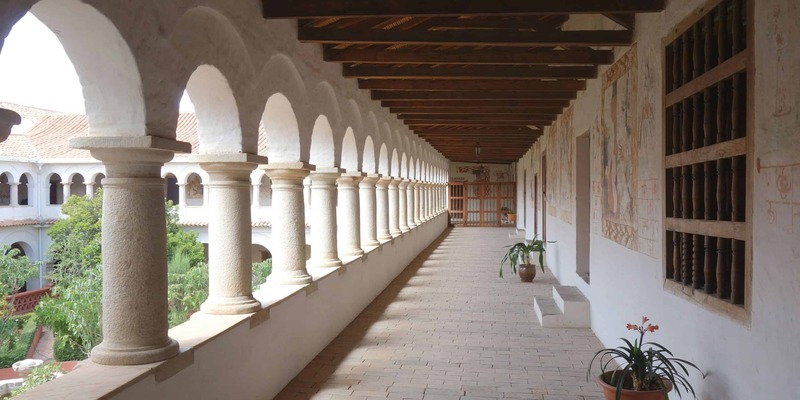 The Museo del Tesoro, located next to the main square, is one of my favourite museums in Sucre. It tells about Bolivia’s wealth of minerals and gems. Did yo know there is a gemstone that can only be found in Bolivia and in no other place in the world? The ticket includes a guided tour in English or Spanish. 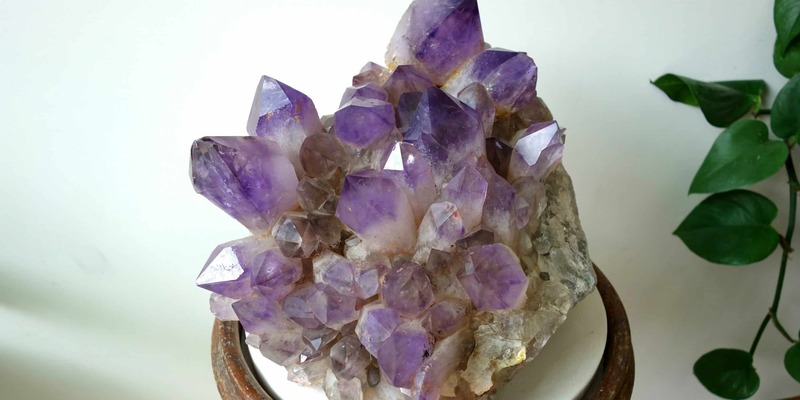 You will learn about the history of the colonial house and Sucre, about silver mining, minerals, Bolivia’s history and, of course, the gemstones. Many of Sucre’s attractions are located close or next to the main square. The Casa de la Libertad is one of them. In this house, the declaration of independence was signed in 1825. These days, you can see a copy in the Salón de la Independencia. The original is hidden, with only one person knowing where it is (what happens if that person suddenly drops dead remains a mystery to me). Your ticket includes a free tour. In theory, guides are also available in English or French, but when we came, we were told that we could take a tour in Spanish only. If you’d rather skip the tour, you can also walk around on your own. The mirador Recoleta, a viewpoint that can be reached by foot from the city centre, gives you a great overview of the city. From up here, you can understand why it’s called the white city. You also get a good view of the Andean Mountains. If you’re thirsty, you can find a cafe here from where you can overlook the city. Also, after climbing all these stairs, make sure to check out the Museo de Arte Indigena that is located nearby. Sucre’s central market is the best place in the whole city to have lunch. On the upper level, you will find many tiny food stalls next to each other. They all serve almost the same food at great prices and the owners will call out to you to catch your attention as you go by. If you want to eat typical local food, go for the chorizo or the mondongo. For drinks, go down to the first level and stop by one of the many ladies selling fresh shakes and juices. The blackberry milkshake is especially good. And if you’re still hungry afterwards, you will find desserts all over the market. The Convento de Santa Clara is only open in the afternoon. 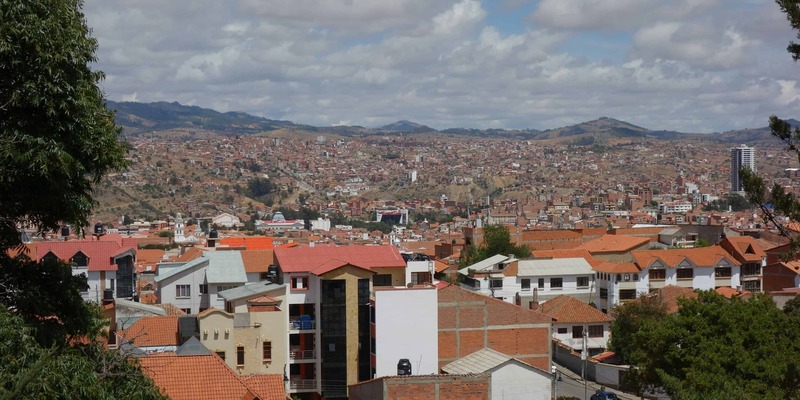 As almost everywhere in Bolivia, you need to join a guided tour to get inside. The tour guide will lead you to the central courtyard, filled with many restored murals unlike anything else I’ve seen in the country. You will also see the beautiful garden, the church, the crypta and two rooms filled with amazing pieces of art. You have to pay extra to take pictures inside the convent and the photo permit only allows you to take them inside the central courtyard. 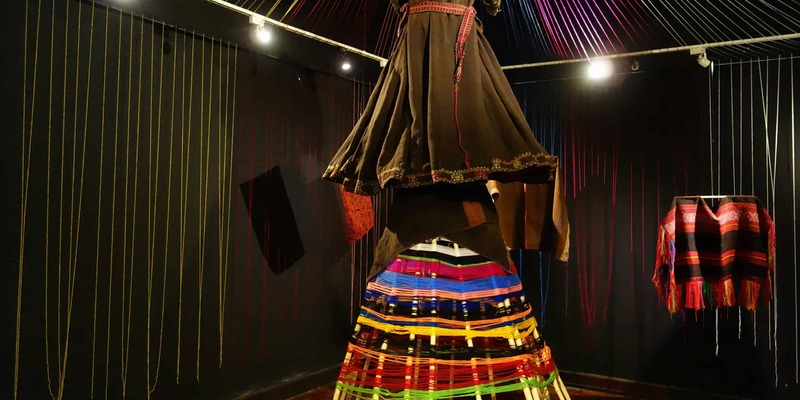 The Museo de Arte Indigena is located close to the Mirador Recoleta and well worth a visit. Inside the museum, you will find textiles from different regions of the country, as well as archaeological finds and a whole room dedicated to music and dance. Explanations are in Spanish, but have been translated into English as well. Over the past years, Bolivia has seen a development of its weaving techniques, with designs getting more and more complex and young people becoming interested in learning and preserving those arts. Your entrance fee will help the weavers so that they can keep practising their techniques. You can also buy many pieces of great art in the gift shop. 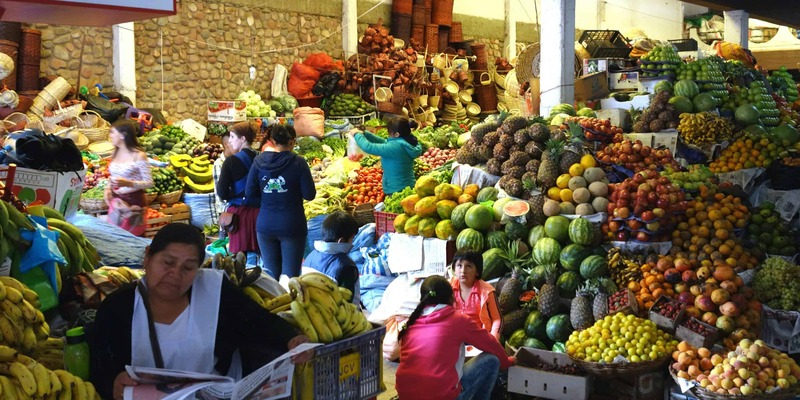 It is easy to find amazing food in Bolivia. My favourite restaurant is, without doubt, Condor Cafe. It serves a daily vegetarian menu for only 30 Bolivianos. The food is fresh and there is such a huge variety that you can come every day. Plus, all income goes towards charity and helps support locals. Another great restaurant is Murano. This fusion of French-Bolivian cuisine is a bit more pricey than Condor Cafe but still affordable. And they serve amazing Crême brûlée for dessert. My favourite viewpoint in Sucre is the Mirador Recoleta, but this one is a close second. The pink palace, as it was also called, now belongs to the city and houses offices. But you can go inside and climb up many staircases until you get to the top of a tower. 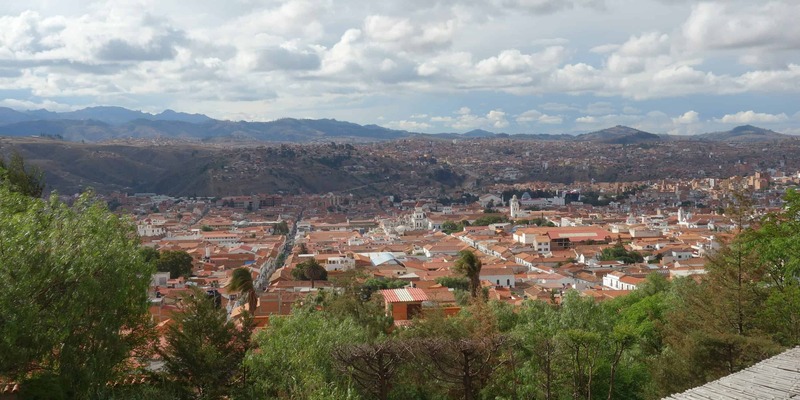 From here, you have a great view of Sucre and the surrounding mountains. Just make sure to watch your head while climbing back down. This palace was built for tiny Bolivians and not for tourists. This museum is also known as Musef. It houses displays about Bolivia’s culture which is as diverse as the many different regions in this country. The exhibits change from time to time so your experience will be different if you come back a year or two later. 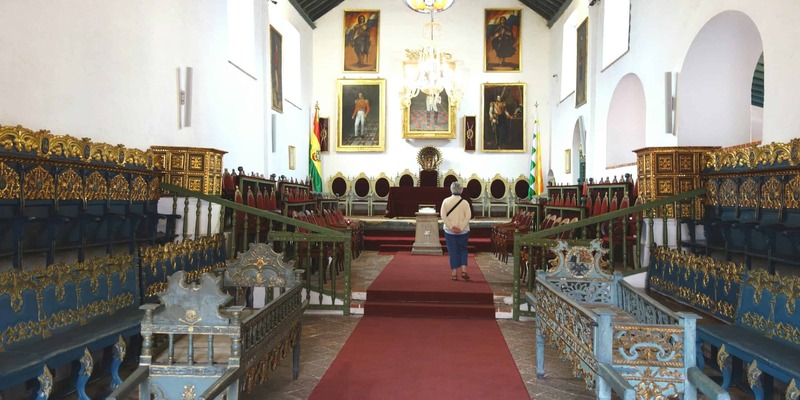 The museum is located in one of Sucre’s many colonial houses and entrance is free.